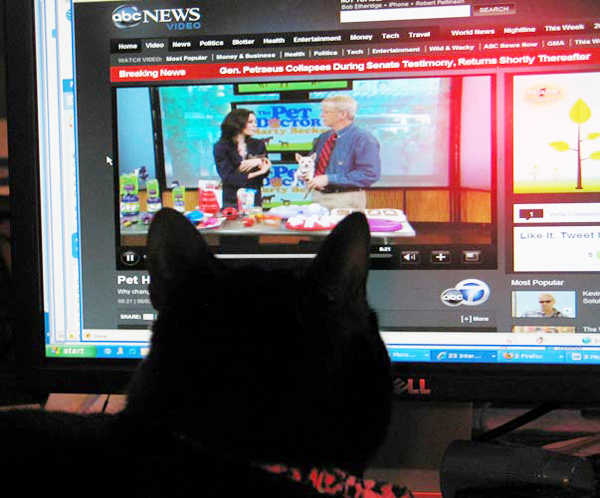 If your cat's behavior is troublesome when you're gone, this might be why. Here are five tips on how to identify and treat it. "I thought only dogs and people had separation anxiety issues!" Those were the first words I heard when Alex, my client, greeted me at the door to his apartment. 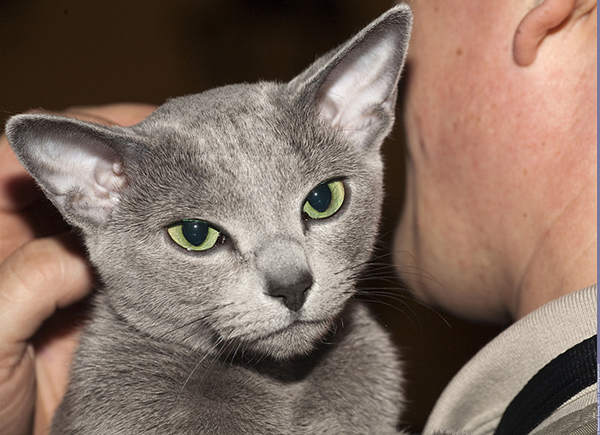 Alex lives with Trotsky, a ten-year-old Russian Blue. The cat’s behaviors are worrisome to his adoring dad because he is urinating on his pillow and howling whenever Alex leaves for the day. The neighbors hate the howling — the caterwauling is nonstop. Trotsky also seems depressed and clingy. He seldom purrs, and he follows his cat parent from room to room, not letting him out of his sight. Alex feels that Trotsky is "mad" at him and is "getting back" at him by urinating on his pillow. He recently started a new job that takes him away from his little kitty on an average of 12 hours a day. What’s behind this? First off, understand that cats are not into revenge. There are always reasons for behavior — revenge is not one of them. Trotsky is not mad at Alex, nor is he trying to get back at him. He is responding to his dad’s long absences by engaging in behaviors associated with separation anxiety. Cats need companionship. Contrary to what some people believe, felines are not solitary animals. It is common for them to form strong, connected bonds with specific people and resident animals. Many of these little ones do not do well when their beloved humans leave for an extended time or when they move away. If these kitties were people, we would say that they have abandonment issues. 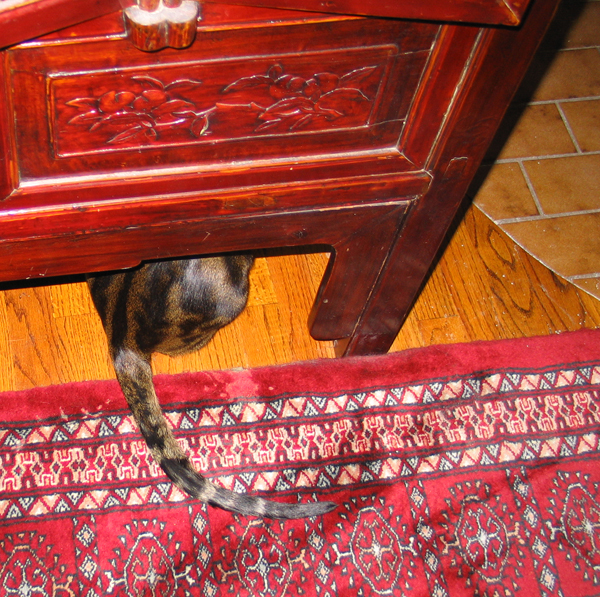 Cats express separation anxiety in a number of ways. 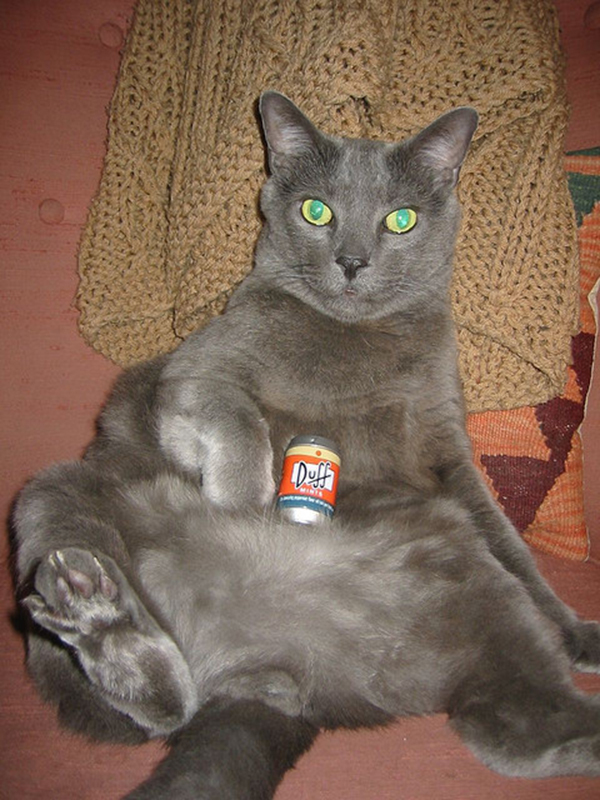 Some, like Trotsky, show they are unhappy by urinating or defecating outside the litter box, often on their cat parent’s bed or clothing. They are mingling their scent with the scent of their beloveds. Loud vocalizations are also indications of separation anxiety, especially when cats howl when the object of their affection leaves. Some cats become clingy, not letting their favorite humans out of sight. Others mope around, or become depressed and hide, avoiding contact with people. Kitties sometimes stop eating or they eat too much; others overgroom and pull their fur out. It is heartbreaking and frustrating when cats have separation anxiety issues. Not all cats exhibiting these behaviors have separation anxieties. Underlying medical conditions can also cause the same behaviors. Trotsky needs to be examined by his favorite veterinarian. Trotsky’s home needs to become fun for him. Tall cat trees and shelves positioned in front of the windows will keep him entertained with the goings-on in the neighborhood. Ball-and-tract toys, puzzle boxes, and ping-pong balls will keep the little latchkey kitty mentally stimulated while his dad is away for the day. Play sessions, treasure hunts and other interactive activities will help Trotsky adjust to Alex’s long hours away from home. Ideally, Alex should schedule two exhilarating play sessions a day with the cat — one before he leaves for work, another in the evening. Treasure hunts are also stimulating and fun. 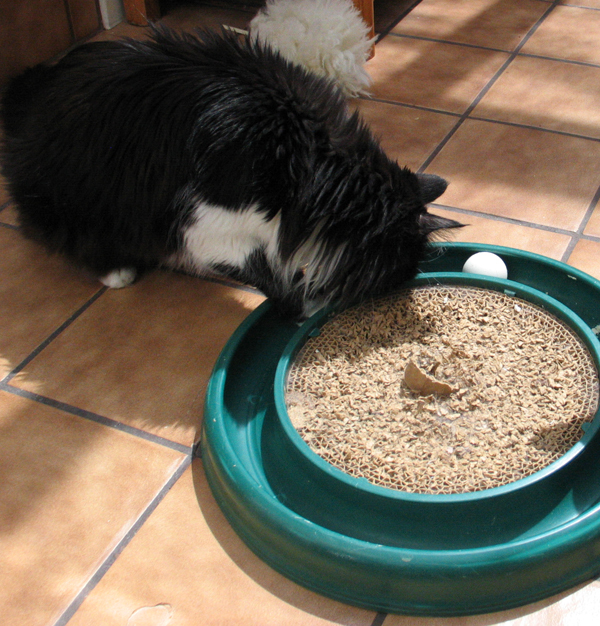 Alex can place treats or cat food on the cat furniture, shelves, in the puzzle boxes, and in the ball-and-tract toys for his cat to find and enjoy. He can also roll treats on the floor for Trotsky to chase. Long goodbyes are depressing for everyone. Alex should not coddle and cuddle his cat just before going to work. Instead, he should say a healthy, happy "see you later" by engaging Trotsky in a treasure hunt before leaving for the day. Prior to positioning the treats around the apartment, Alex can confine his kitty in another room so that he does not see where the treats are placed. After hiding the treats, the cat dad should open the door of the room so that Trotsky can hunt for the prizes while he leaves for work. The sound of Alex’s voice along with his scent can help the little feline not feel abandoned. Cats are very responsive to their favorite peoples’ voices. Weird as it sounds, old-school telephones with voice recorders can reassure kitties who are left alone. Alex should take a few minutes out of his busy day to call Trotsky and leave a message. 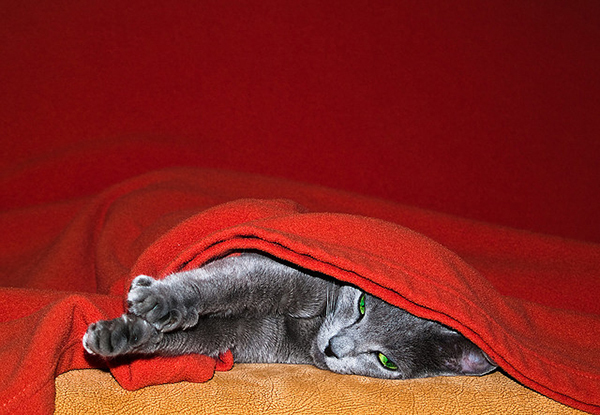 Before going to work, the cat parent should place a towel or item of clothing that has his scent on it where his little kitty naps. When work dictates that he takes road trips, he can seal freshly scented items in plastic bags — one for each day he will be away from the cat. Every day, the pet sitter places a fresh, Alex-scented towel wherever Trotsky hangs out. Keeping a consistent schedule will also help Trotsky not feel abandoned. Times should be set aside every day for doing activities the cat enjoys, such as playing, grooming, and treasure hunts. Additionally, Trotsky needs to fed on a schedule. An auto feeder is helpful, timed to open a few times during the day while Alex is working. Some cats need a little extra help. If the environmental and behavior modifications are not helping Trotsky adjust and eliminate his anxieties, a veterinarian can prescribe a course of medication. Have you had a cat with separation issues? How did you resolve them? Tell me about it in the comments!